DRY, ITCHY SKIN: IS IT ECZEMA? 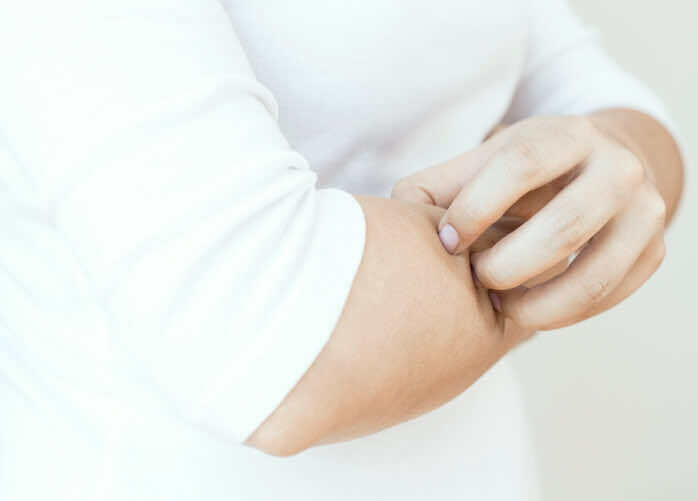 Eczema, also known as atopic eczema or atopic dermatitis, is one of the most common skin conditions, affecting mainly children, but some adults too. Our private doctors here at LDC have seen hundreds of patients living with eczema, across their many years in General Practice. Like other conditions, treatment should be tailored to the individual patient in question, and our doctors are happy to work together with patients to find the most effective way of managing their eczema. This article gives you a brief overview of the topic, including the treatment options for managing the condition. Where Do People Usually Get Eczema? The full reasoning behind why eczema happens is unclear. It usually occurs in people who have other allergies too, such as hayfever or asthma. These are all known as ‘hypersensitivity conditions’, whereby the body overreacts to normal stimuli, such as pollen or dust. Eczema also often runs in families. Eczema is not contagious so you cannot pass it on to anyone else. Many people who have eczema have specific triggers of flare-ups, which may include soaps, detergents, stress and water. Food allergies (such as cow’s milk, or eggs) and other allergies can also be involved. In women, hormonal changes, particularly those associated with periods, can also affect eczema. You may need to keep a diary of triggers and flare ups. If you have eczema, your skin is unable to retain moisture and becomes dry and itchy. The symptoms of eczema come and go. When the symptoms become more obvious and worse, this known as a flare-up. Flare-ups may occur two to three times a month. The itchiness can even disrupt sleep due to the discomfort, cause bleeding at the affected area and increase the risk of infection. Regions of the skin that are affected by eczema can become temporarily darker or lighter after flare-ups. This may be more noticeable in those with darker skin. These changes are part of eczema as a condition and are not due to scarring or the effect of treatments. The skin will eventually return to its normal colour. Your GP can diagnose eczema by asking you questions about your medical history, and examining your skin. These are steroid creams that reduce swellings, redness, and itching during flare-ups. You should use your emollient creams all the time (at least twice a day), even if you do not have symptoms. This should help reduce dryness and itching long term. During a flare-up, using more of the emollient cream, together with steroid cream, will help reduce symptoms more quickly. Topical steroid creams should be used whenever you have a flare-up, no more than once a day. They come in varying strengths depending on how bad your eczema is. If you find yourself needing to use your steroid cream frequently, you should see your GP as you may need a different treatment. There are other stronger creams that might be prescribed if you have troublesome eczema. If you have severe itching, you may be prescribed antihistamines or be given bandages to allow the skin to heal. Not scratching your eczema is very important to keeping your skin healthy. Scratching can result in scarring and permanent skin damage. You might reduce scratching by keeping your nails trimmed and covering your skin with light clothing. If you notice any of these above symptoms, you should visit your doctors surgery as soon as possible, for a review and any necessary treatment of the infected area. Whether you’ve never been diagnosed with eczema but are suffering from the symptoms we have mentioned, or you have eczema and are searching for better help managing the condition, London Doctors Clinic‘s experience GPs are here for you. From providing the first diagnosis, to offering a second opinion, our doctor are always able to advice. And with eight private clinics dotted around London, we should never be too far away when you’re in search of a “GP near me“.